Not long after Apple announced the new iPad, accessories are starting to flow in from all directions. Spigen SGP has promised that it'll release its amazing glass screen protector for the new iPad and so it has. Spigen SGP's Glas.t is made from a slab of 0.4mm thick tempered glass that has been reinforced to increase shock absorbency, and automagically adheres itself to the screen surface using a specially formulated silicone adhesive. 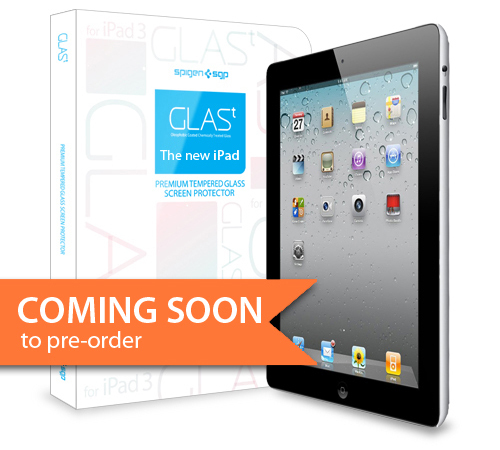 The Glas.t glass screen protector is said to be compatible with the high resolution retina display of the new iPad 3rd gen and features an anti-shatter film, oleophobic coating and does not affect touch sensitivity. will be available for the new iPad 3rd Gen in April with pre-orders opening up soon. Pricing TBA. You can find the Glas.t for both the iPhone 4 and iphone 4S and Samsung Galaxy Note available now.